Posted on May 26, 2015 May 27, 2015 by Mark R.
“Real life” kept me away from Eve for the better part of a month, but I’m back! After catching up on all the EveMail, Reddit threads, and Twitter twittery, I came across a video from The Scope sourced from footage taken by missing idealistic scientist posterboy Hilen Tukoss. The scope outlines a Servant Sisters search and rescue operation. Curiosity piqued, I decided to devote the next couple hours to chasing the ghost of Hilen Tukoss, beginning with the location purported in the video to be a search and rescue staging area: the Eiyfr Biotech Station (presumably in Elgoi). As I approached the system, I was surprised to find an abundance of Circadian Seekers. When I was last in-game about a month ago, Circadian Seekers were a novelty; something you’d encounter every once in a while and usually never in groups that numbered more than two or three. Now, that may have had a lot to do with the higher security areas that I was frequenting, but for me at least, seeing a whole cluster of them together was a bit startling. One of the largest groups I encountered was in the Colelei system, a Gallente controlled system in the Sinq Laison region. They seemed very interested in the system’s gates and the surrounding security forces but were leaving traveling capsuleers alone. I was ‘on a mission’ so I didn’t stick around long enough to perform a detailed reconnaissance. I had places to be…I had a ghost to chase. Several jumps later, I arrived at the Eiyfr & Co headquarters in the Elgoi system (Metropolis region). 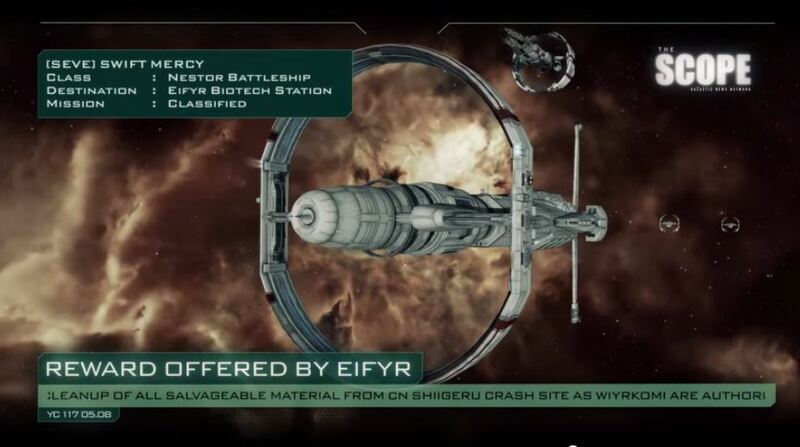 For those of you unfamiliar with the company, Eifyr & Co is a tribal-backed (Minmatar Krusual Tribe) biochemical/cyber corporation with a particular interest in wormholes and Sleeper technologies. They are also famous for being the new employer of Hilen Tukoss following his Caldari defection on August 7, YC113 from Zainou Biotech. Being that Eifyr is Hilen’s present employer, I figured that checking-out their headquarters was the prudent thing to do. Arriving at the station, all was quiet…really quiet. There were a couple barges hovering around the structure and system activity was limited to miners doing what miners do. But no bother, I hadn’t really expected to find anything too interesting. I had another location in mind worthy of investigation. The project’s mission statement, which further expounds on the goals of Arek’Jaalan, can be found here. Site One: Antiquus as viewed during my excursion. This was my first visit to Site One and I was immediately impressed by the sheer size of the compound and the bustle of activity which filled my Overview the second I came out of warp. 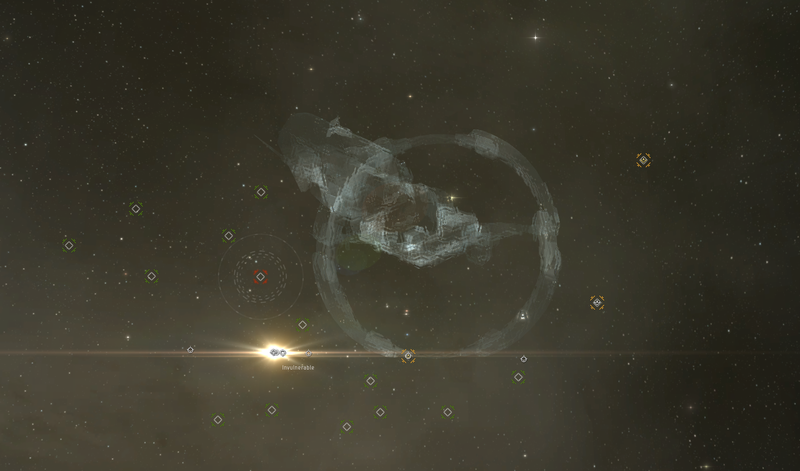 I also noticed a restricted acceleration gate which was off-limits to capsuleers. Could this be where Hilen began the trip that would take him to the unknown location featured in the Scope footage? The sleuth in me wants desperately to get through that acceleration gate, but it looks like I’m unable to do so for the time being. Though a feast for the eyes, Site One had little further to offer with regards to what happened to Hilen and I turned my sights back to the map. I had read in some forums that some capsuleers believe that the enormous structures seen in the Hilen footage released by Scope may be a super-weapon; possibly a super-weapon that was responsible for the Caroline’s Star phenomenon. It seemed like a reasonable possibility to me, so I turned my attention toward the navigable systems closest to the frustratingly impenetrable Jove Space. Looking at the map, I noticed a landmark I hadn’t seen before that pertained to the E-8SCQ system. Needless to say, a description like that is irresistible. “Warp drive activated.” If you approach the G5ED-Y system, you’ll immediately notice how many Jove Observatories start to appear on your overview. What were once considered a chance encounter, easily become a “given” in this area. I haven’t looked at any of the Observatories in this region up close yet, but I’ll be sure to check them out before leaving. It stands to reason that this area was strategically important given that its basically a Jovian border zone, so I suppose I shouldn’t be surprised by the abundance of abandoned Jovian structures. There were, however, a surprising lack of Circadian Seekers or Drifter Battleships. 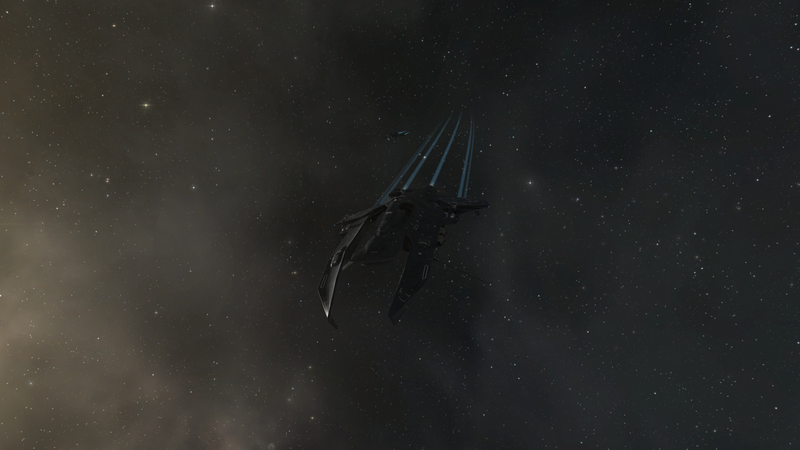 Perhaps that is due to the very, very strong presence of Caldari Naval apparatus in the region…not to mention Guristas. 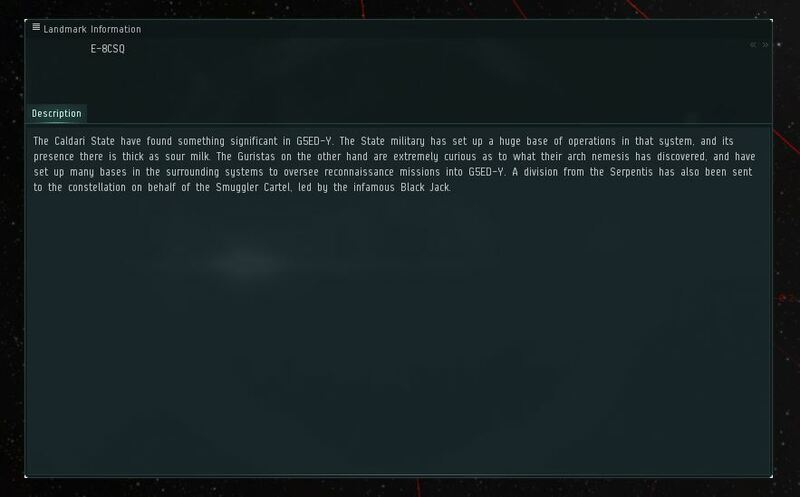 The major State outpost in E-8CSQ was recently nicknamed ‘Kois City’, in referral to Admiral Aurobe Kois who runs the military operation in the constellation. 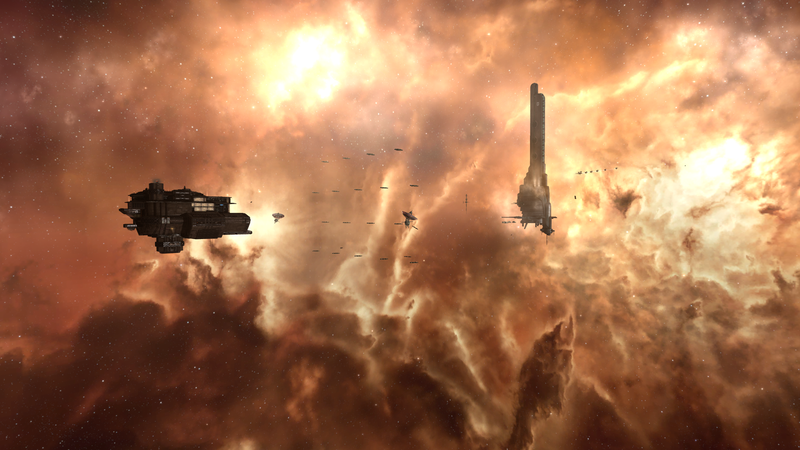 It began as a small base of operations but quickly expanded as more and more personnel arrived from the Caldari State, especially with the fleet Aurobe brought with him. 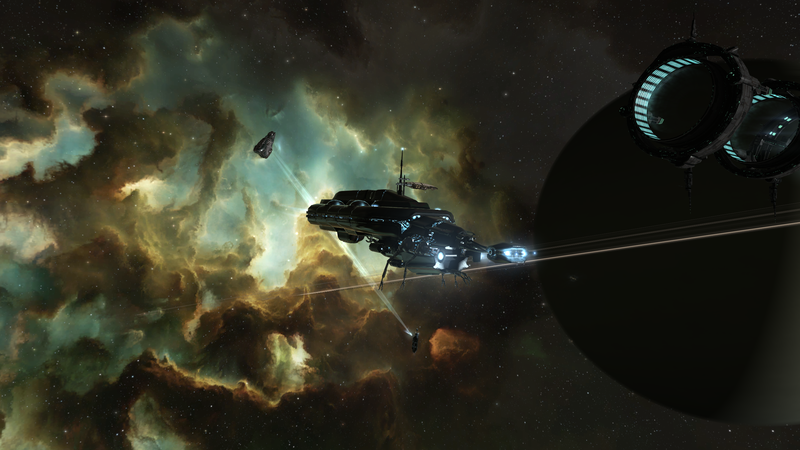 It is now a bustling hub of activity, ‘a beacon of Caldari strength that shines through the unremarkable corner of the galaxy we call E-8CSQ’ (Admiral Aurobe Kois’s words). The Guristas have proven to be quite the adversary, however, attacking and looting many of the State’s small outposts in the constellation. Many expeditions have not returned, which is usually blamed on Guristas interference. However to this day none of the pirate factions have attempted a direct assault on Kois City, as they would most likely be no match for its formidable defenses. Again, this area is extremely fortified (just look at my Overview.) Something is clearly going on here. The units appeared on my Overview as hostile and belonging to an NPC called Taibu State. 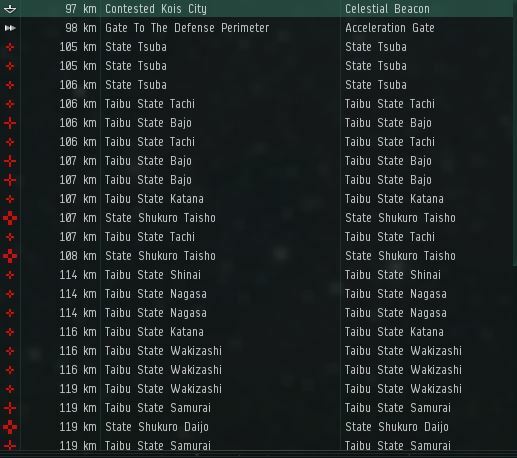 I have never encountered Taibu State units before and I’m still at a loss to explain who they are; though they are clearly somehow affiliated with the Caldari Navy. I’ve tried the usual Google Search, but there really doesn’t appear to be any information on them. I’ll keep digging and keep you posted. Aside from the massive snake-shaped asteroid in the middle of the installation, there is also a prominent acceleration gate. Given the proximity to Jove Space and the intensity of the defenses, I can’t help but think that this gate may lead to a location within Jovian territory. Perhaps it even leads to the location where Hilen Tukoss sent his most recent broadcast. The list of “what-if’s” goes on forever, but I have to say that I’m genuinely excited by so much cryptic activity so close to Jove Space. I am burning to know whether the fortifications are to keep capsuleers out of the gate or to keep some nefarious “unknown” from crossing over. Additional photos/details can be found in the addendum to this post which can be found here. The other very obvious feature of the system was the massive build-up of Guristas units. Everywhere I looked, there was a Guristas-related Cosmic Signature. 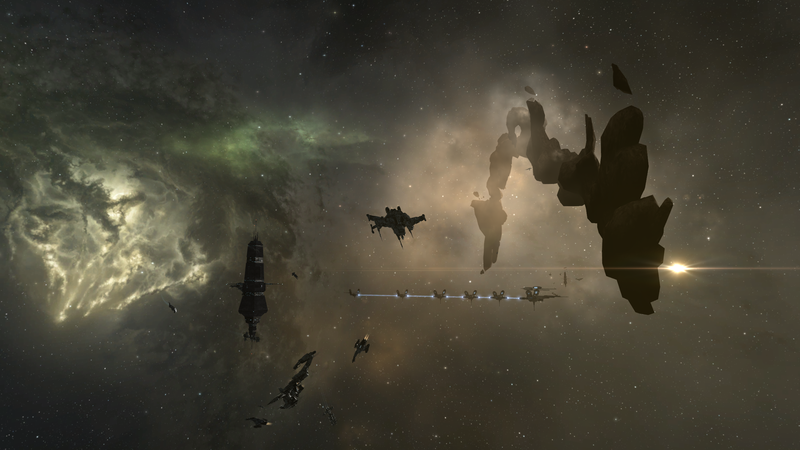 Whatever the Caldari and Guristas are on about, it’s something clearly worth their time and manpower. Found a 2006 reference, apparently it was added in Revelations.